At St Paul’s C of E School we aim to enhance and enrich the lives of children by enabling them to make the most of good learning opportunities within and beyond the curriculum. We believe PSHE education has a crucial role in preparing pupils for the world of work, helping them to develop the skills and attributes they need to thrive and achieve their full potential. At St Paul’s, PSHE education underpins the ethos of our School and is very much a whole School approach, working with all members of the School community and the local authority. PSHE within School is delivered as a rolling programme from Foundation Stage to Year 6. The curriculum model aims to meet all individual, group and local needs. To enable this to work, teachers and children are regularly consulted on the content ensuring flexibility in the material covered and that it is relevant and up-to-date. Our PSHE programme is reviewed and evaluated to ensure that provision is of the highest quality. The teaching matrix, ‘What do we Teach in PSHE at St Paul’s?’, is planned and delivered in the areas of RSE*, DATE*, Health and E Safety. As a school, we use the SPIRAL RSE & DATE Scheme of Work (Stockport). Complemented by resources from the Christopher Winter Project. Anti-bullying education is delivered using the ABCD Curriculum and our Golden Rules. We use a variety of resources to support the children’s learning. These include the Anti-bullying Alliance, Bullying UK, NSPCC, Child Line and Family Lives. We are supported by the ‘Expect Respect’ education toolkit produced by Women’s Aid in our teaching around the issues of Domestic Violence. Expect Respect is a specific resource which is based upon protection, prevention and provision. 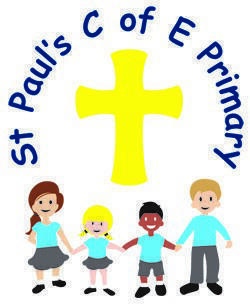 What do we teach in PSHE at St Paul's C of E Primary School? Our Reception children learn about these areas of PSHE through cross-curricular teaching which is taught throughout the year. Who are the people in my family? How am I different/same as other people? DATE: Healthy Eating & the importance of physical activity - What do I need to grow healthy & strong? Who to Report a Concern to? Name parts of female & male human body. Safety of self & others. When to say no, scenarios. DATE: Why do people smoke? DATE: Medicines are drugs – know the difference! Positive & negative effects of drugs. RSE: Growing up –naming body parts. Understanding different types of families. Touching, a right to say no. A new life begins – how a baby is made? Responsibilities of having a baby.